Kassiopi is a quite lively resort situated at the north east corner of Corfu and around 38 Kilometers from the islands airport. The resort is a well developed holiday destination but is still a working fishing village where you can see the local fishermen bringing in their catch at the end of the day. The town and its surrounding area is a thriving holiday resort that provides something to suit all visitors and holiday makers. Kassiopi is a main port for trips all over the island of Corfu by both boat and coach. 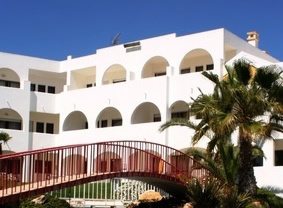 The accommodation here is mainly the apartment type, with larger villa accommodation on the outskirts and the area surrounding. The resort is lively day and night and attracts a mixture of people. The beaches here are quite pebbly with an adequate supply of sunbeds and umbrellas, on the main beach there are showers toilets and changing areas. There are also water-sports facilities available here. For shopaholics there are plenty of shops including, bakeries and supermarkets, tourist shops selling leather goods, gifts and souvenirs, clothes, some good lace and linen shops, ceramics, jewellery, and English newspapers. There are also a couple of internet cafes. Kassiopi is a lively resort therefore it has many bars and tavernas that come alive during the evening, many of these bars play music videos on widescreen and also films. At night the 'Plattia' or village square is the place for the teenagers to 'hang out'. The harbour area is also a great place to enjoy a sun-downer or a cocktail or two. In addition to the beach and water sports, there are other things to do on Kassiopi holidays as well, you can play tennis at nearby tennis courts, boat trips for hire, pony treks, bikes for hire, plus excursions to the likes of Sidari, Ipsos, Dassi and Nissaki. Serious hikers will enjoy the challenge of a hike to top of Mount Pantokrator and by reaching the top your prize will be some spectacular views of the island and some truly wonderful surrounding countryside.